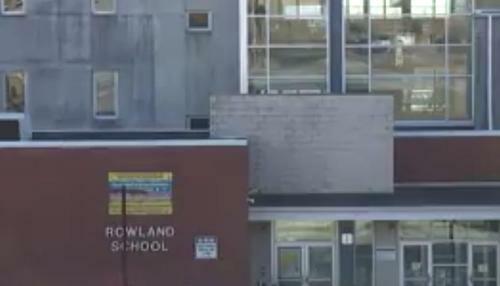 An eighth-grade student has had enough. She is taking a stand and talking about how lunches are served at her school that is located in Harrisburg Pennsylvania. With her lunch being in the last lunch period of the day, she usually gets the short end of the stick. Often times the cafeteria is sold out of the better quality foods. She recalls that usually, hamburgers are the only option that is left for her to “choose” from. And, if that problem isn’t enough, there are the burgers themselves. She says the burgers aren’t appetizing at all. They often appear undercooked and pink. This isn’t something that would appeal to anyone, kid or not. The burger is served with a mere orange. She goes on to tell us that the only thing she consumes from her meal is the milk and fruit. And even though her lunch period is the last lunch period, she ends up starving by the end of the day. You can’t expect to be full off of an orange and 12 ounces of milk. No one besides a toddler could expect to be full on that. 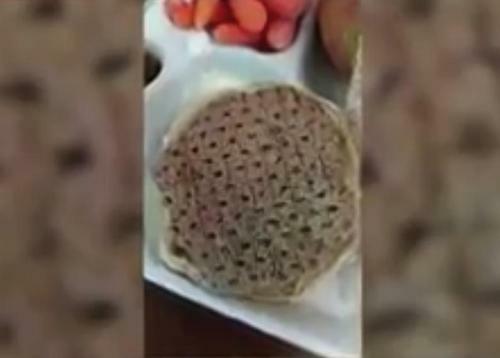 After a mom shared a photo of one of the burger, many students along with their parents, are taking a stand with her. Students claim that the burgers look like this daily. 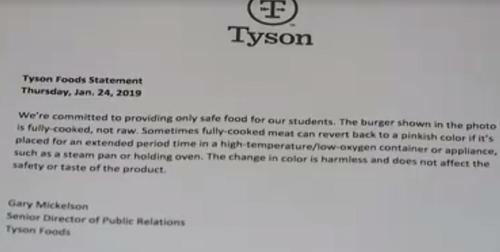 It’s been brought to attention and SFE and Tyson state that “already cooked” burgers are safe to eat regardless of the pink color. BUT, STUDENTS WON’T BE TAKING THEIR CHANCES. WOULD YOU? Would you eat this burger or expect your child to? Let us know in the comment section below and don’t forget to pass this along to your friends and family to see if they’ve ever seen anything like this before!